n 2003 there were more than 6.3 million motor vehicle crashes reported to police. Of those, 38,252 crashes resulted in fatalities. In 2003, 15,251 people were killed in alcohol-related car accidents, representing 40 percent of all motor vehicle fatalities for that year. In 2001, crashes were the leading cause of death for people ages 4-33 in the United States. America's families spend more than 19 cents out of every dollar earned on transportation, an expense second only to housing, and greater than food and health care combined. The individual cost of congestion exceeded $900 per driver in 1997, resulting in more than $72 billion in lost wages and wasted fuel. Drivers seated higher think they are driving more slowly than drivers seated lower, and so tend to speed more often. Anywhere from 10% to more than 70% of people in urban traffic are simply looking for parking. More than 80% of traffic in a typical city runs on 10% of the roads. People who live on streets with more traffic spend less time outside and have fewer friends. Saturday at 1 p.m. has heavier traffic than weekday rush hours. Highways can handle more cars at 55 mph than 80 mph. When roads are closed for construction, traffic on other nearby roads often decreases rather than increases. SUVs can reduce the capacity of signalized intersections by up to 20%. It takes longer for people who circle looking for the “best” parking spot in lots to get to their destination than those who pick the first spot they see. People are willing to spend longer walking to and from a parking spot in parking lots than on city streets. A driver driving at 30 mph sees an average of 1320 pieces of information every minute. After thirty seconds of waiting, most people will begin to cross against the light. People are more likely to jaywalk when well-dressed people do it first. Studies have shown driving aggressively, which raises crash risk and increases fuel consumption, saves just a minute on a 27-mile trip. 350 people die every year entering the freeway the wrong way; at least 50 are killed by cars in driveways. One in five urban crashes is related to searching for parking. New cars crash at a higher rate than older cars. Most crashes happen on sunny, clear, dry days. More New Yorkers are killed legally crossing in crosswalks than jaywalking. Drivers drive less closely to oncoming cars on roads without center-line markings. The fatality risk in the backseat of a car is 26% lower than in the front. Parents on the “school run” increase local traffic by a third. Only about 15% of U.S. schoolchildren walk to school. If everyone waits to merge at the point where a highway loses a lane, rather than earlier, traffic flows better. U.S. statistics show that half of all fatalities happen at impact speeds of less than 35 mph. Men honk more than women, and men and women honk more at women than at men. Drivers in convertibles with the tops down are less likely to honk than those with the top up. Drivers honk faster at cars whose drivers are on cell phones. And drivers are more likely to honk at people from another state or country than their own. Drivers honk less on weekends. The average driver looks away from the road for .06 seconds every 3.4 seconds; drivers search for something in the car 10.8 times per hour. Pedestrians think drivers can see them up to twice as far away as they actually can. The most commonly dropped objects on Los Angeles freeways are ladders. The more Stop signs a road has, the more likely drivers are to violate them. In the U.S., fuel taxes would have to be raised from 20 to 70 cents a gallon for drivers to fully pay for the cost of roads (unlike in Europe, where drivers pay more than roads cost). Car drivers drive closer to helmeted cyclists (and farther from cyclists who who appear to be women). 85 percent of all transportation costs in the United States are related to private automobiles. 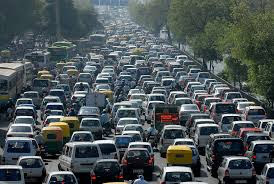 Congestion results in 5.7 billion person-hours of delay annually in the United States. Drivers in one-third of U.S. cities spend more than 40 hours a year (an entire work week) in traffic that is not moving.